My wife, Song, had some leftover yellow daisies sitting in the corner of our kitchen after her ikebana meeting. 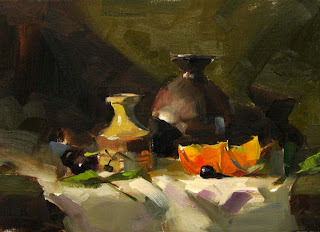 I put them on my still life stand and did this painting almost en plein air. I really had hard time when I started. The value range was very narrow, the purples and yellows are almost the same in value and temperature. It was so abstract at the beginning that I almost gave it up. I straggled through and kind of like how it turned out. I like to have the painting as abstract as possible but keep the accuracy so the painting still representational. I will be in Dallas, TX this weekend teaching my third workshop of the year. Keep checking and I will keep you posted. My second demo was to show how to paint roses. I made everybody very tense at the workshop. I was painting very slowly, making sure every stroke counts. 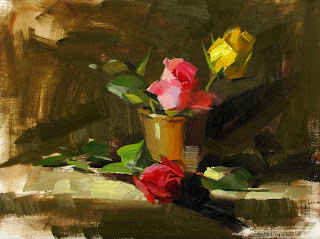 I painted quite a few roses by now, but I still feel it is tremendously challenging. 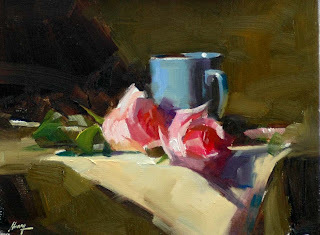 I wish I could have practiced more, because I have not seen much progress in my rose paintings for a while. I am working on freeing more time for painting this year. So far I have not seen any effect. But I am trying. Although I am teaching, but I don't feel I know much more than my students. 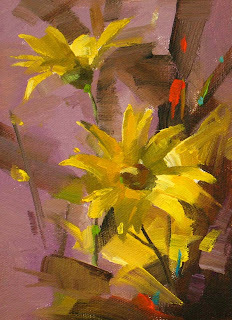 Many of artists attending my workshops are spectacular painters. They inspire me and help me grow. I am really grateful about that. I have spent 3 wonderful days in Phoenix AZ, and had a really great time. Before this trip, I did not know that Phoenix and Scottsdale are so close. I arrived on last Thursday afternoon. It happened to be the date of the Scottsdale gallery walk. All galleries were open to very late hours. A local artist named Li Mahalik picked me up, and we went to see great art in Scottsdale. I was amazed to see so many great paintings there. I have learned quite a bit. Arizona is so beautiful. It changed my idea about desert completely. The saguaros are so huge. I really like their shapes. I wish I did some plein air there. The workshop went very well. I really appreciate the hard work of Li Mahalik and Sue Hunter for putting this workshop together. I made many new friends. Thank you very much for coming. This painting is my first demo at the workshop. 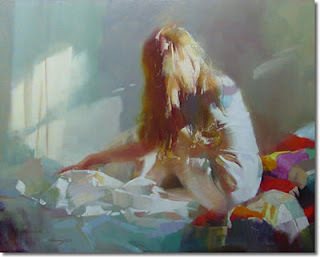 I interrupted my research on white colors and come back to my usual way of painting for my today's post. The R&D will keep going, and I will keep you posted. In about an hour, I will be on my way to Phoenix AZ for my 2nd workshop teaching this year. I will let you know how it goes in my next post. See ya. Another paintingless week has passed solidly. I finally got some time because today is a holiday. I am continuing my research on colors of white objects. I have two lights for this still life: one warm and one cool. I think I am getting a little closer now to my goal. The table cloth still needs some work, but objects are not bad. Compared with my usual way using high chroma colors for the center of focus. This type of painting definitely makes a change. 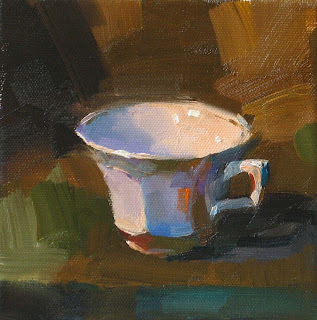 I will do more "white" paintings to achieve the ability of controlling the subtle changes in colors. Today is the Valentine's Day, and the Chinese New Year as well. I want to devote my today's post to my beloved wife. Song and I met in high school. We married in Alabama. For 17 years, she has been on my side from the Deep South to New England, from California to Texas. We have gone through together the hardship of the first generation of immigrants. We have enjoyed every progress in our small family. When I feel blue, she cheers me up. When I lost, she is my best guide. When I feel tired, she is my Yoga teacher and acupuncturist. Without her help and support, I can't imagine my art can be successful. Many of you have met her in my workshops and shows. Recently she starts to organize workshops. English language and computer operation are big challenges for her, but she works very hard and progressed wonderfully. I feel I am very fortunate and grateful for being with her. 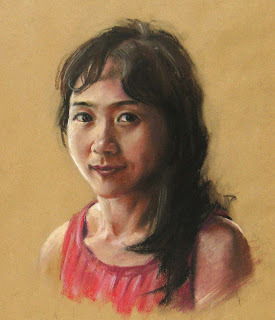 The art I share with you today is a pastel portrait of my dear wife I did many years ago, and I want to say: Song, I love you forever! Yes. It is the same white cup. As many of you following my blog, I consider myself a beginner painter. I need to learn a lot to improve my art. I don't meant to bore you, but I really need to study my colors on white objects. It shouldn't be very hard, but I am not there yet. I will work and work until that "Aha" effect clicks. Across both fields of art and science. I sensed the major difference on the way people communicate. Scientists are very sensitive on words. They define their vocabularies precisely. The invented mathematics to extend their logic and make sure their statements are quantitatively measurable. They set up conventions to make sure their discussion on the common bases. They exchange ideas in massive amount of conferences and symposiums. They try to avoid "reinvent the wheel". However, in art, at least from my limited observation, the communication is rather nebulous. Many masters claimed that art can not be talked about and can not be analyzed. We are pretty much on our own. We have to "invent our own wheels" on the individual bases. Our rules are made to be broken. I heard cases that some art teachers bring students to the paint-out spot and disappeared. Some art school teachers hide themselves from their students. Maybe I am naive, but I still think art can be taught and learned. This is my second demo painting at Sacramento. Painting roses is rather tricky. You can't overwork on them. Make sure very brush stroke counters. Observe more and paint less. I hope all the workshop attendees have learned some and achieved some improvement on your art. Time goes really fast. My second workshop is coming up in less than two weeks. I will go to Phoenix, AR. I think we still have a couple of spots available. If you are interested in attending this one, please contact Sue Hunter at: suehunter7@cox.net. 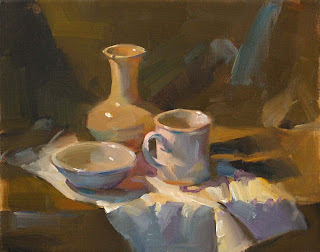 After several years of receiving requests for workshops, I am pleased to announce in August 2010 a painting workshop held in the beautiful country of Italy. 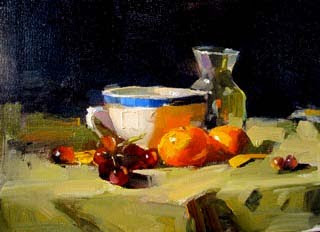 It will be a 12 day event with 8 days of painting instruction. Please see brochure for more details. If you would like more information regarding this workshop including costs, itinerary, and registration details, please email Jason Bowen – Italy Workshop Director at jasonbowenart@att.net. You may also contact Jason directly by phone at 925-323-0664 for specific questions that you may have regarding the workshop. 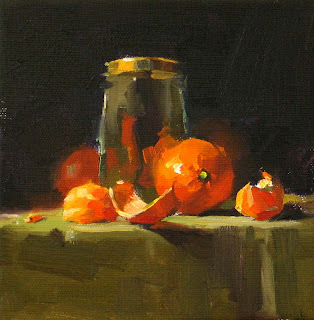 Last weekend I taught a 3-day workshop at the Capital Art Center in Sacramento. I want really thank Patris Miller for organizing it. It was a wonderful three days. I enjoyed so much meeting old and new friends. This one is my first demo painting. I came back last night and found there are many things need to be taken care of right away. I may not be able to paint for a while. Many of you have found that my website was down. I have figured out the problem and just fixed it. The response of Calvin Liang's workshop is phenomenal. We have got many more than 15 people in a very short time. Song is communicating with Calvin to see if he can give two in a row. Even with two, we will still have to put many people on the waiting list. Without any rest, I came to work this morning and ran into the rat race immediately. I think my humpty dumpty is falling. I am trying my best to call all the kings horses come a little earlier.